Ellington Colliery in Northumberland, the last deep coal mine in the North East of England, was closed by its owners UK Coal in January 2005; bring to another proud industry in the region to an end. The decision sparked a debate as furious as any during the miners’ strike with the owners saying flooding had made the pit unprofitable, while the unions argued it could be saved. 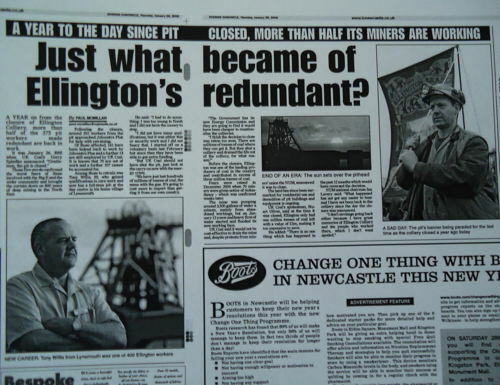 This how the Evening Chronicle reflected on the pit’s history. Just five weasel words were needed to end centuries of our industrial heritage. “Gentlemen the pit is closed” were the words from Ellington axeman Gerry Spindler. What it meant was the Big E, the last superpit in a once proud industry battered by unrest, was closing. Opened in 1909 as part of the Ashington Coal Company, its workforce soared from less than 800 at the outbreak of the First World War to 1,200 in 1921 and to an all-time high of 2,179 at the time of the 1984 strike. In 1983 the pit set a record producing 1m tonnes of coal in 29 weeks. From employing more than 2,100 men in the 1980s, the announcement has left the region’s 340 remaining miners out of work and the surrounding community stunned. Once there were 200 pits across the Northumberland and Durham Coalfields and at the end of the Second World War there were 148,000 men employed in the mines. It was North East coal which fuelled the industrial revolution and the heavy industries that sprang up across the region. Local historian Neil Taylor worked at Ellington Colliery for 20 years, following in the footsteps of his father William, in the early 1920s, and grandfather, also called William, who was there at the beginning. He has written four books on the social history of mining around Ellington. It was not until around the modernisation of the pits in the 1950s and neighbouring Lynemouth Colliery forced to close a decade later, that Ellington’s humble colliery was transformed into a superpit which became known Big E in the 1980s. Neil said: “It was because of the fact that Lynemouth had closed because of a fire in 1966, they had also discovered a new drift. “When they accessed the coal seams Ellington and Lynemouth started to be combined. Lots of Lynemouth men transferred to Ellington. Until the arrival of the Alcan Power Station in the early 1970s, Ellington remained the area’s only large employer. The men at the pit helped to produce almost 12,000 tonnes of coal a week, most of which was used by the power station. But the pit was to be hit by the often bloody miner’s strike of the mid 1980s which infamously saw violence flare between pickets and police. Although the North East coalfields had been devastated by closures 17 pits still remained when the miners and Margaret Thatcher went to war. 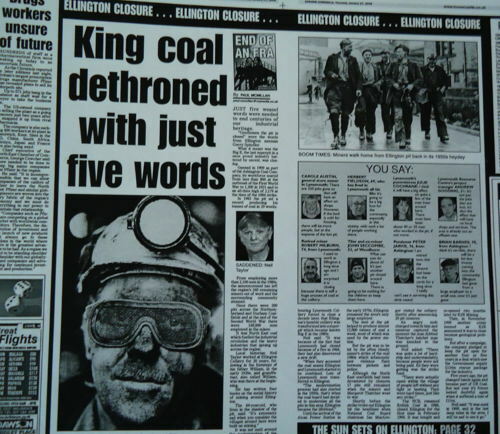 Shortly before the strike broke out Ellington hit the headlines when National Coal Board chairman Ian MacGregor visited the colliery shortly after announcing 20 pit closures. An angry mob charged towards him and cameras captured the moment the man dubbed Thatcher’s hatchet man was knocked to the ground. Neil added: “There was quite a lot of hardship and understandably, because people were not being paid. All they were getting was the strike fund. The NCB, renamed British Coal in 1986, closed Ellington for the first time in February 1994. It was bought and re-opened two months later by RJB Mining. Then, in November 1999 another crisis loomed as RJB announced it was to close because geological problems. But after a campaign, the company pledged to keep the pit open for another four or five years in a deal which saw the Government supply 110m rescue package for the industry. 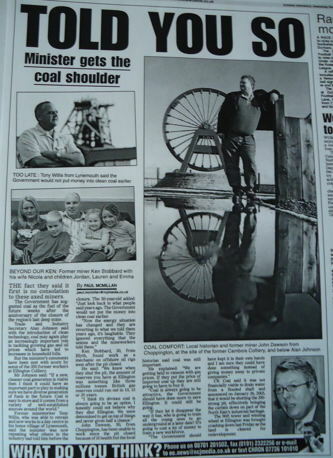 Five years ago, the pit changed hands again and became part of UK Coal. But last year it’s future looked doubtful again when it suffered a loss of 11m. To coincide with the first anniversary of the Ellington Colliery closure, I attempted to find out what happened to those who had been made redundant. Just what became of Ellington’s redundant? A year on from the closure of Ellington Colliery, more than half of the 375 pit workers made redundant are back in work. Those five words confirmed the worst fears of those involved with the Big E and the wider community and brought the curtain down on 800 years of deep mining in the North East. Following the closure, around 352 workers from the pit approached Jobcentre Plus for help with retraining. Of those affected, 161 have been helped back to work by Jobcentre Plus and a further 14 are still employed by UK Coal. It is known that 70 are out of work and a further 107 cannot be accounted for. Among those to retrain was Tony Willis, 50, who gained qualifications in care work and now has a full-time job at the day centre in his home village of Lynemouth. He said: “I had to do something. I was too young to finish and I did not have the money to stop. “I did not have many qualifications, but it was either this or security work and I did not fancy that. I started off on a voluntary basis last February but since then they have been able to get extra funding. “But UK Coal should not have shut the pit, just look at the carry-on now with the energy crisis. We have just lost hundreds of millions of tonnes of coal, the same with the gas. It’s going to cost more to import than getting it from our own country. “The Government has its new Energy Commission and they are going to find it would have been cheaper to renationalise the collieries. Before the closure, Ellington was one of the leading producers of coal in the country and contributed in excess of three million tonnes of coal. Fears were raised in December 2004 when 70 miners were given notice of redundancy which was confirmed weeks later. The mine was pumping around 3,500 gallons of water a minute, mainly from abandoned workings, but on January 12 a new and heavy flow of water started and flooded its new working face. UK Coal said it would not be cost-effective to drain the mine and, despite protests from miners’ union the NUM, announced it was to close.The land has since been earmarked for residential use and demolition of pit buildings and equipment is ongoing. UK Coal’s spokesman, Stuart Oliver, said at the time it was closed, Ellington only had one million tonnes of coal left with a value of £3m, making it too expensive to save. He added: “There is no one thing which has happened in the past 12 months which would have reversed the decision.NUM national chairman Ian Lavery said: “What happened has not got any easier to bear and I have not been back to the colliery since the day the closure was announced. A month later the UK Trade and Industry Secretary Alan Johnson suggested coal may once again play a part in the country’s economy with the introduction of new clean technologies, which was little consolation to the unemployed Ellington miners. The fact they said it first is no consolation to these axed miners. The Government has suggested coal as the fuel of the future weeks after the anniversary of the region’s last deep mine. Trade and Industry Secretary Alan Johnson said with the introduction of clean technology, coal could again play an increasingly important role in tackling growing gas and oil prices, which have led to increases in household bills. But the minister’s comments have been met with scorn by some of the 350 former workers at Ellington Colliery. Former mineworker Tony Willis, who was able to retrain and now works in a day centre in his home village of Lymemouth, said the minister was now repeating what others had told him before the closure. The 50-year-old added: “Just look back to what people said years ago. The Government would not put the money into clean coal earlier. Ken Stobbard, 30, from Blyth, found work as a mechanic on offshore oil rigs soon after the pit closed. He said: “We knew when they shut the pit, the amount of reserves you have at Ellington was something like three million tonnes. British gas reserves could run out in 10,15 or 20 years. John Dawson, 50, from Choppington, has been unable to work since the pit closed because of ill health but the local historian said coal was still important. He explained: “We are getting held to ransom with gas prices. If they put the price of imported coal up they are still going to have to buy it. Coal is always going to be attractive, the Government should have done more to save Ellington. It could still be going. UK Coal said it was not financially viable to drain water from a flooded shaft and announced on January 26, 2005, that it would be shutting the 350-strong pit, effectively bringing the curtain down on part of the North East’s industrial heritage. The 90ft tower and winding wheel at Ellington was brought crashing down last Friday as the land is cleared for redevelopment.